The Dragonfly Dance this band does moves carefully through a compositional bent a la Maria Kalaniemi (who accordionist Javier Palancar can compete with on every level of expertise! ), the spirited energy of Kepa Junkera, touches of eastern European darkness and an overarching sense of sheer ebullience. The accordion dominates in this unique Spanish band, driven by percussion, acoustic guitar, bass and mandola, colored by zanfona, flutes, dulzaina, violin, clarinet and bass clarinet. "They play free, joyous music. They gave me goose pimples when I heard the music, at once harsh and sweet, of my hometown, with an accuracy that very few other musicians had accomplished before them. Their strength is in their rotund virtuosity and their astonishing inspiration. (Lorenzo Silva, winner of the 2000 Nadal prize for novel). "A band of virtuous players that shine in the small Spanish folk cirtuit. Their music goes from the melancholy to the jubilant, with certain rural roots that remind the listener how, not so long ago, Madrid used to be a diligence post in the dusty roads of the dull center of the Peninsula." (Howell Llewellyn, Billboard, February 2003). "Snappy and swingy, largely instrumental, musically eclectic Madrid band, including very fine clarinettist José Ramón Jiménez. Verdict: thumbs up [best marks]" (Folk Roots, September 2003). "One of the best folk albums I have heard in these last years" (José Ángel Hevia, Asturian piper). "These six musicians are destined to fill a niche in the small history of this country's folk music, provided that history and justice walk in the same direction. The best thing that happened to roots music in Spain since Berrogüetto. A little prodigy, a dazzling event." (Nano Amenedo, Diario de Ávila, April 28, 2000). Baile de libélulas (Dragonfly dance) is the title of La Bruja Gata's second album, one of the most eagerly awaited recordings in the Iberian peninsula's roots scene. 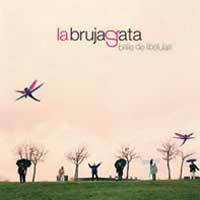 After the auspicious start of Manual de pociones (2001), which garnered the group the Villa de Madrid award to the best pop music album, and the distinction of being considered "best new talent of the year" by the prestigious Billboard magazine, this second instalment confirms La Bruja Gata as having one of the most energetic, vital and infectious blends to be found among musicians of ethnic and acoustic leanings. The specialized press had a hard time searching for adequate words to describe the music of this Madrid-based sextet, a veritable melting pot of multiple influences with a specially identifiable sound. With Baile de libélulas a peculiar LBG universe takes foothold. Easily accessible tunes coexist with mischievous, minutely detailed arrangements in such a way that we can seldom foresee what the next measures will bring. Hence the fascination of the group members at the movements of the dragonfly, a small insect sharing more than a few characteristics with the music of La Bruja Gata: delicacy, brightness, unpredictability. To sum it up in one word, motion. Whereas Manual de pociones had fire as the predominant natural element, Baile de libélulas hovers a little more around the concept of water, with song titles as "La mar salada" (The salt sea), "El gran sol" (The big sun) or "Panorama del acantilado" (Cliff landscape). In fact, the whole album vindicates music as a fitting vehicle to evoke different times and places, the sea as a metaphor for freedom and nostalgia as a healthy exercise to keep looking ahead. Given that the band members have deliberately discarded any type of reductionist geographical adscription, a track like "Playa garabatos" (Scribblings beach) has a Mediterranean flavour, whereas "Nana incierta" (Uncertain lullaby) blends a lullaby from Extremadura with some klezmer elements and even some vaudeville touches that would not be out of place in a Kurt Weill composition. "Señales de vida" (Life signals) starts from a Zamora charro rhythm and builds up to a proclamation of the sizzling spirit of the group, whereas the nine minute-long "El gran sol" feels like the soundtrack for a documentary on Galician sailors, people that are made of a very different matter than common mortals. "Vendavales de poemas" (Poem winds) adds some verses of lyrical homesickness, and it is not hard to imagine a group of schoolchildren hurriedly going down the stairs at the strains of "La hora del recreo" (Playtime). Baile de libélulas es el título del segundo disco de La Bruja Gata, uno de los trabajos más esperados en los territorios de la música peninsular de raíz. Tras el notorio debut con Manual de pociones (2001), que les proporcionó el Premio Villa de Madrid al mejor álbum de música popular y la distinción de Mejor talento fresco del año en la prestigiosa revista Billboard , esta segunda entrega corrobora a LBG como una de las propuestas más enérgicas, vitalistas y contagiosas que pueden encontrarse dentro de los sonidos de filiación étnica y acústica.